Chelsea sit 15th in the Premier League heading into the weekend’s matches and Spurs have the opportunity to pile the pressure on Jose Mourinho when the Blues visit White Hart Lane on Sunday. Both squads are coming off long midweek trips: Chelsea to Tel Aviv, Israel and Tottenham to Baku, Azerbijan. While both squads fielded what was nearly a first choice XI in these fixtures, Chelsea will have had two additional rest days. This match will undoubtedly be a challenge for Poch’s men, but a good result will go a long way in Spurs’ hunt for Champions League football, given Chelsea’s current state. With the injury to Thibaut Courtois, former Stoke keeper, Asmir Begovic, will get the start in goal. John Terry – who sustained an ankle injury against Maccabi Tel Aviv on Tuesday – is doubtful for Sunday’s match, so we will probably see the pairing of Gary Cahill and Kurt Zouma in the center of defense. In Chelsea’s 1-0 win over Norwich last weekend, Jose Mourinho surprisingly started 19-year-old Brazilian, Kenedy, over César Azpilicueta at left back. Kenedy had a solid match, completing an impressive 93% of his passes while completing four dribbles. The teenager was a sincere offensive threat (unsurprisingly, as he is also a winger) for the Blues and could very well be back in the lineup on Sunday. At right back is Serbian international, Branislav Ivanovic, who just returned from injury. Should Mourinho opt for the same defensive midfield pair as he did against Norwich and Tel Aviv, we’ll see the combination of Nemanja Matic and Cesc Fábregas. Fábregas has not yet managed to produce at the same rate as last season – he averaged a league leading 0.6 assists per 90 minutes last year, but has only produced two assists this season (a rate of 0.2 assists per 90). Matic is certainly the more defensive of the pair and will sit a fair bit deeper. In the attacking midfield, look for the combination of Willian, Pedro, and Hazard. Of particular note is Willian’s success from direct free kicks this season, the Brazilian has scored five times from direct free kicks in the Champions League and Premier League this campaign. Spurs will need to be wary of conceding fouls in dangerous areas, especially considering that the Lilywhites lead the league in fouls conceded per match (14.2). Up top is Diego Costa, who has only scored three times this season. And he has not been shooting often either, averaging only 2.1 shots per 90. To put that in perspective, Kane averages 4.1 while Son, Mason, Eriksen, and Chadli also produce more shots than Costa. If Chelsea are to move forward, they’ll need a bit more from their #9. Spurs will certainly be tested by a long Europa League trip that saw them secure a round of 32 berth. 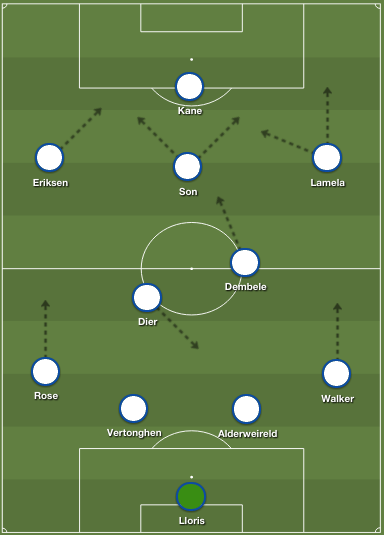 Poch did not hesitate to play his best, fielding a lineup very similar to what we might see on Sunday. Davies and Trippier will probably be replaced by Rose and Walker, and Dembélé may come into the fold. Alli's suspension will likely see Lamela come straight back into the side with Son also starting.